If you open the Mac App Store right now and do a search for “twitter,” you’ll find results just like the ones in the image above. You may recognize the official Twitter app along with some of the most popular and prolific third-party clients. Right below Twitter for Mac you’ll find Twitterrific. Twitterrific has been around for quite a while now, and was the very first native Twitter application ever built for Mac. It was also the first app to use the word “tweet” to refer to the posts on the network, and introduced many modern staples like conversations and replies. To this day it remains a popular choice among users and has seen many major updates and redesigns. It’s currently on its fourth major version. In December 2012, Twitterrific 5 was released for iOS devices. The Iconfactory, Twitterrific’s developers, promised that a Mac version of the updated app was in development and would include support for the new iCloud syncing feature and an all-new design. Three days shy of a year after releasing the iPhone update, however, users were given what is currently the app’s most recent update. It included only two bug fixes. The developers have noted that the 5.0 update for Mac is facing big delays. So what’s going on here? Why has it taken two years for any more news of the update? When will the new version finally be available? The unfortunate truth? Not even the developers know. To understand the issues that have stalled the development of Twitterrific 5, we first need to talk a bit about some decisions Twitter made two years ago. In August 2012, Twitter announced that it would be changing how it handled third-party applications that accessed its platform. Starting with the launch of version 1.1 of the Twitter API, developers would face limits on how many users would be allowed to use their applications. New applications would be allowed to have 100,000 users before they were cut off. Applications that had already gained 100,000 by September 5 would be allotted twice their current user base before being cut off. This spelled bad news for a lot of applications. Twitter promised to work with developers who needed extra tokens to support more users, but only at their own discretion. As you know, we discourage developers from building apps that replicate our core user experience (aka “Twitter clients”). We know that there are developers that want to take their passion for Twitter and its ecosystem to unique underserved situations. As such, we have built some flexibility into our policy with regard to user tokens – which went into effect September 5th, 2012. …Unfortunately, It does not appear that your service addresses an area that our current or future products do not already serve. As such, it does not qualify for an exemption. The developers of a pair of Windows 8 and Windows Phone apps called MetroTwit announced in March 2014 that the software had been discontinued due to the API token limit. On Android, an app called Falcon hit the limit in February 2013 and ended up in the same situation. Most recently, the “classic” version of another Android app called Talon ran into the ceiling just as the developer released a new version of the app that used a new set of tokens. So what happens when these apps run out of tokens? For starters, new users will be unable to log in through the app. If you’re currently using the app, you should be safe. If you log into your Twitter account online and “revoke access” to an app with no tokens, you might be able to quickly log back in through the app and reclaim your spot, but if someone else grabs that token before you do, you won’t be able to use that app anymore. Hopefully by now you can understand the problem here. All apps eventually hit the token limit and Twitter gets to decide whether they are different enough from the “core experience” presented by first-party apps to earn a reprieve. And I’m sure by now you’re starting to understand why I’m explaining all of this in the middle of an article about a popular Mac app. As you may have already guessed, Gedeon Maheux of the Iconfactory has confirmed that Twitter’s limit on API tokens for third parties is a big part of the reason Twitterrific hasn’t been updated yet—and why it may never be. Because Twitterrific had been around for so long before the API limits were announced, the app should have had plenty of room to grow. After all, it had been collecting user tokens for over five years now, and would be allowed to double that number before being cut off. Unfortunately, it seems all of that room didn’t help as much as it could have. 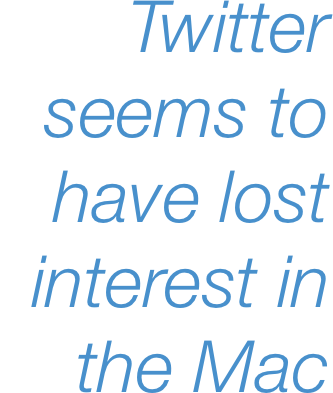 Earlier this month, we spoke to Gedeon Maheux about Twitter’s limitations on third-party developers and the Twitter client market on the Mac. [Twitterrific 5 for Mac] was underway at the time [of the Twitterrific 5 for iOS launch], then Apple announced iOS 7 and we had to make a choice. Since we were using the Chameleon framework to actually port the iOS code to the Mac, if we updated Twitterrific for iOS 7, most of the Chameleon stuff would have to be scrapped. We essentially would have to start over. Maheux also said that when the team was faced with that decision, the OS X update was “about 65% done.” The choice was made to update the mobile version of the app for iOS 7, which resulted in the unfortunate side effect of having to give up the current progress on the Mac version, and eventually rebuild the entire thing natively for OS X Yosemite with no iOS code or the Chameleon framework. Ever since the Iconfactory found themselves faced with the task of building an entirely new application from scratch, “there’s been no real work on the Mac.” The problem, Maheux says, is not so much the code, but the company’s inability to gauge interest in the update and find a way to make back production costs. One reason for choosing to prioritize the iOS app over the Mac app? That token limit we talked about earlier. While Twitter doesn’t provide exact numbers to developers, many have come up with ways to determine roughly how many tokens they have left based on stats like app sales. The Iconfactory found that the iOS version of Twitterrific was in a much better place token-wise than its desktop counterpart. Because the limited number of tokens available to any specific app places an upper limit on how many sales a developer can expect, pricing a Twitter client becomes a challenge. When Tapbots launched Tweetbot for Mac two years ago, the app came in at a whopping $20—more than Tapbots developer Paul Haddad had originally wanted to charge, and more than many users were expecting to pay. Maheux says that if Twitterrific 5 for Mac is ever released, he’d prefer to keep the price lower than that, as long as the Iconfactory was able to make enough money to offset the cost of building and maintaining the app. Unfortunately, that can be hard to determine without actually releasing the app and seeing how many people are willing to buy. When asked if he would rather choose a higher price to help offset costs or simply discontinue the app, Maheux responded that he would absolutely lean toward the higher price. “We all REALLY want to do it [update the app],” he said, but until they can find a way to minimize the financial risk, there’s too much uncertainty about the Iconfactory’s ability to recoup its costs. Maheux has been trying to come up with a way to determine exactly how many people would be interested in the update, and has considered options such as a Kickstarter, but hasn’t found anything that could fit the company’s needs. When you take into account the fact that Twitterrific is the oldest Mac Twitter client on the market and has started running into this issue, you can bet that the rest of the market will soon find itself in the exact same position. This leaves quite a conundrum, not only for the Iconfactory, but for anyone developing a Twitter app on any platform. Unless they can find a way to remove the risk of spending years developing an application only to meet lackluster sales that barely offset development costs, developers will become more and more hesitant to keep building. Sadly, that appears to be by design. Twitter’s decision to limit third-party developers seems to be based on a desire to push users to official platforms like Twitter for iPhone and Twitter for Mac. Once third-parties have all run out of tokens, new users won’t have anywhere else to go. While many people prefer third-party clients over the official mobile apps, it’s hard to deny that they set a standard for first-party apps that Twitter for Mac is lagging behind in a big way, and Twitter seems to have lost interest in keeping it up-to-date. On October 2 2014 Twitter for Mac gained support for multiple photo uploads per tweet—something the iPhone app has had since March. Despite the recent update, the Mac app is still missing support for viewing animated GIFs, which arrived on the mobile app in June. In fact, Twitter for Mac is missing a number of important features that are available elsewhere, such as the ability to edit lists. You also won’t find the blue “conversation lines” in the desktop version, even though they’ve been on mobile for quite some time now. Heck, you can’t even search for a user on the Mac app. Luckily, Twitter’s in-line ads (called “sponsored tweets”) haven’t made their way to this app yet, either. 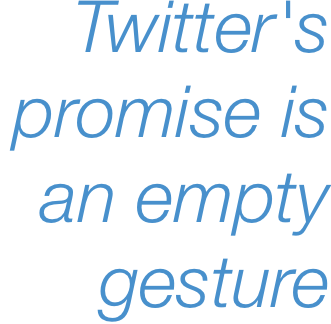 This poses quite a problem for Twitter and its users. Ben Sandofsky, the company’s Mac and iOS project lead, claimed in April 2013 that he was taking a break from the iPhone app to focus on the Mac client. In May 2014, after six relatively small updates consisting mostly of bug fixes and design tweaks with only a handful of feature additions, Sandofsky announced that he was leaving Twitter. I’ve worked at Twitter four and a half years. It's been a great run, but it's time for something new. I'm leaving at the end of the month. Since Sandofsky announced his departure from Twitter earlier this year, there has been only one update to the Mac app. Twitter for iPhone has seen twenty updates in the same period of time. With every update that comes to the website instead of Twitter for Mac, it becomes more and more clear that the social network’s leadership is intent on pushing people toward the web rather than native desktop apps. While it could be argued that Facebook’s browser-only approach to the desktop has worked out fine for that company, it’s important to consider the difference in Twitter’s mission when compared to Facebook’s. Twitter’s aim is to be your real-time news feed, a window into “what’s happening” right now, as the placeholder text in the website’s tweet composer puts it. A native app is far more suited to becoming that “always-on” live feed than a website. Also consider how Facebook re-orders users’ timelines based on what a computer thinks is popular, thus eliminating any chance of making Facebook a live platform for news and current events. That option would almost certainly never work for Twitter (though they have recently gotten into rearranging timelines to show conversations in a single location). Facebook’s decisions shouldn’t be Twitter’s decisions. Twitter belongs in native apps running on the desktop. That type of exposure and immediate availability make Twitter the go-to destination for updates when news breaks. Nobody does a “live-Facebook” of an Apple event for a reason (well, OK, we all have that one friend who does, but come on). By limiting the ability of third-party developers to create unique and useful clients for its service, Twitter is ensuring that new users will be forced to use one of its first-party solutions, whether that’s Twitter for Mac, TweetDeck, or the web. Unfortunately, none of these products are really worth using, and Twitter is shooting itself in the foot by attempting to drive users to these subpar experiences. As for Twitterrific? Maheux says he expects the existing app’s tokens to last for a few more years (barring a sudden influx of new users), and the company will continue to support it as long as it keeps making money, which could be quite a while after the tokens run out thanks to the app’s ad-based revenue model. He also added that if the Iconfactory can garner enough interest in an updated Mac app to offset production costs while finding a way to mitigate some of the financial risks, they’ll do it. Other developers, however, will certainly run headfirst into the limit long before Twitterrific does and be forced to discontinue their apps. There’s a way to resolve this issue, of course, and as you might expect, it’s the obvious one. Twitter for Mac isn’t currently monetized, and it doesn’t seem there are any plans to monetize it in the near future. Twitter can (and should) remove the API token limit—for desktop applications at the very least—until it can provide a proper, native desktop user experience.